Forage fish are small, schooling fish that play an essential role in the marine food web throughout their lives. Forage fish eat plankton, converting it into available food for marine mammals and seabirds and other larger, commercially and recreationally important fish, such as tuna, salmon, striped bass, and cod. 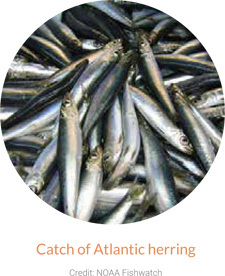 Examples of forage fish and other “prey species” include herring, anchovy, krill, shrimp, menhaden, and sardines. There is growing awareness that we need to manage forage species more conservatively than we have in the past to ensure healthy marine ecosystems. The guidelines for National Standard 1 (NS 1) of the Magnuson-Stevens Act (MSA) highlight the need to manage important prey species in order to provide adequate forage for all components of the ecosystem. The guidelines recommend fishery managers take this objective into account when establishing annual catch limits through federal management plans, specifically, by maintaining abundance of forage species at levels higher than the conventional standards contained in the Act. For example, many prominent scientists and research institutions agree that a target near 75 percent of an un-fished population is desirable for most key forage species. Fishery managers need to prioritize the management of forage fish just as they do target stocks. Defining a species as a “forage fish” to apply more conservative management measures, however, is often difficult. Furthermore, most of the regional fishery management councils lag in implementing necessary management plans for ensuring adequate conservation of forage fish for marine ecosystems. Congress should amend the MSA to clearly mandate that regional fishery management councils in accordance with emerging best practices for maintaining the ecological role of these prey species Specifically, the MSA should require that the abundance for forage species be set higher than the biomass level needed for maximum sustainable yield (MSY). This would put the Act in accordance with the guidelines for National Standard 1. This more conservative management of forage species is core to the MSA’s goal of supporting and enhancing the health and productivity of marine ecosystems, which in turn are vital to supporting and sustaining important and valuable commercial and recreational fisheries. Require each regional fishery management council to identify and designate key forage species within its jurisdiction. Require fishery management plans (FMPs) for designated forage species to specify a minimum biomass threshold that is at least as high as the biomass level associated with producing MSY and, in accordance with NS 1 guidelines, recommend that forage species abundance be maintained above this level. Also require FMPs to consider the ecological importance of maintaining a balanced age structure and geographic and seasonal range for forage species. 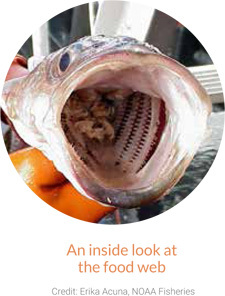 Prohibit the authorization of new fisheries for unmanaged/unfished forage fish unless or until the council has had an adequate opportunity to assess the scientific information relating to any proposed directed fishery and to address potential impacts to existing fisheries, fishing communities and the greater marine ecosystem.